We normally have a short holiday break in the weeks running up to Christmas. The last two years were to Disneyland Paris and Center Parcs in Sherwood Forest . We were not planning to have one this year, but our daughter was doing a school project on Florence Nightingale and so we wanted to visit the Florence Nightingale Museum at St Thomas' Hospital. As it was approaching Christmas we decided to have a weekend in London to visit the museum and see some of the Christmas markets in London. We have visited London with children already before. Weekend in London with a baby and weekend in London with a Toddler. This time was with our 6 year old daughter and 3 year old son. We travelled to London on Saturday afternoon. We drove by car to the London Underground station at Hillingdon. There is a monitored car park at the station which costs only £1 per day at weekends (more during weekdays). This avoids the problem of finding a parking space in London and avoids paying the congestion charge. Children under 10 are free on the underground when accompanied by and adult. We used an Oyster card for our travel. A deposit is needed for the Oyster card and then it needs to be topped up with credit. When using the card it automatically deducts the single fare, but then when reaching the daily maximum for the zones travelled (the same amount as a one day travelcard) remaining travel (within those zones) for that day is free. The card can also be used on buses and trams. For the underground you need to use the card on entry and exit, but for the buses and DLR trains only swipe once per journey. We didn't take a pushchair so didn't have any of the issues associated with taking a pushchair on the London Underground. Some of the underground trains were busy. I was ashamed by how selfish some of the passengers were. On more than one occasion adults pushed passed our 3 year old to beat him to an available seat, and one 8 month pregnant women had to stand because nobody would stand to allow her to sit down. This included someone sat in the priority seat - which specifically states it should be given up to someone that is pregnant - who was more interested in keeping the seat so he could carry on playing games on his smartphone. One thing about the underground is to factor in the time spent travelling. We found that time seamed to go quite quickly when trying to get around so we ended up with a very late evening when travelling for a meal and then back to the hotel on Saturday night (although that was partly due to a long wait for food at the Rainforest Cafe). As per a previous visit we stayed at the Express by Holiday Inn hotel at Southwark. This is a nice hotel that includes free breakfast so is particularly good value. We had booked a family room, which included a double bed and a double sofa bed which was already made up. The only problem with the hotel was that the TV didn't work. It had a box on the TV (freeview / hotel TV) which had a European plug, but was missing and adapter. The hotel is about 10 minutes walk from the Southwark tube station or very close to the RV1 / 381 bus stops. The 381 provides the most direct route to Waterloo station, but the RV1 seams to run more frequently and I believe is only a little further. We weren't able to travel to London until the afternoon and didn't arrive at the hotel until late afternoon. We took the bus to Waterloo for the Southbank Christmas Market where we had a ride on the carousel and a look around the stalls. After visiting the market we went to the Rainforest Cafe at Picadilly Circus. The station was heavily congested when we arrived and most of the entrances / exits were locked. They were locked with a chain and padlock which seamed to be particularly dangerous when you consider that there has been a tragic fire on the London Underground in the past. After we left the station we went straight to the Rainforest Cafe arriving later than we originally planned at 7.00pm. They don't accept bookings so we were put on the wait list and were told to return in about 30 minutes. After a short wait, during which our children had their faces painted (additional charge) we were seated. We ordered our meals, but then had to wait for nearly an hour before the food came out. Most of the food was very nice, but my son had pasta bolognese which is normally his favourite, but didn't eat it. I tasted it myself and was not impressed, the sauce had a strong tomato taste, but very little meat. Based on the delay in food and general lack of service I asked them to remove the 12% tip that they'd automatically added to the bill. This is the first time I've ever been so disappointed to ask for an automatic tip to be removed before I paid the bill. As a result of the delays in the food it was nearly two hours before we left and so a very late night when we got back to the hotel. The main reason for us travelling to London was to see the Florence nightingale museum. We visited the museum on Sunday morning (arriving shortly after it opened at 10am) and spent about an hour at the museum. We then walked to the tube station and took the Tube towards Buckingham Palace. The suggested tube station for Buckingham Palace is Green Park, but we went to St James' Park. The pedestrian route is marked from the station going over the blue bridge where there is a good view of the palace. We then took the children on the playground near Buckingham palace before walking towards Hyde Park Corner. 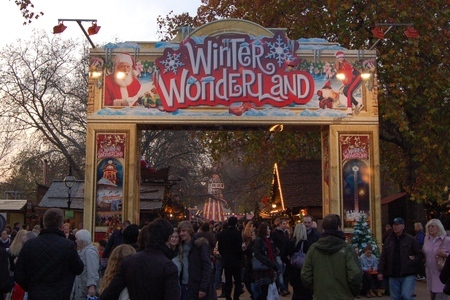 We went to the Hyde Park Winter Wonderland. This included a Christmas Market and large funfair. 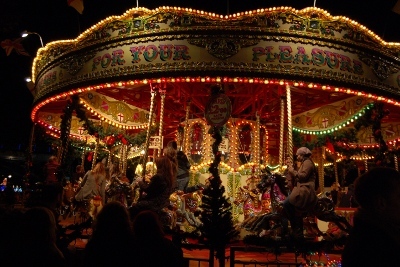 The weather was particularly mild for the time of year (late November) and so we were very warm at the Winter Wonderland. We finished off with a bit of shopping before retrieving our suitcase from the hotel and heading back home. We had a good, but tiring weekend in London. Whilst we only had a fairly small itinerary we still didn't really have time to do everything we wanted (although the Hyde park WinterWonderland was not something we'd planned to go to it was well worth going to). Our young son is a big train fan. Prior to going we had watched Underground Ernie DVD and he enjoyed going on the underground and the bus ride, our daughter enjoyed the Florence Nightingale Museum (because that is what she was doing at school); but I think it was the visit to the Winter Wonderland that made the weekend most special. We managed to fit something in to satisfy the whole family.